PT Perkebunan Nusantara V - PTPN V or known as PTPN 5 is a reputable agribusiness company in Indonesia, based in Pekanbaru Riau Province. PTPN 5 has strong business commodities on palm oil and rubber plantations. 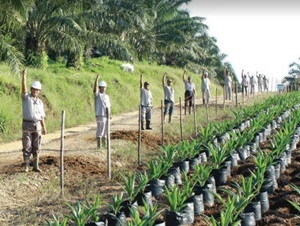 PTPN 5 has a palm kernel plantation with a total area of 78,340.09 Ha. PTPN 5 also supported by 12 units of Palm Oil Mill (PKS) with a total installed capacity of 570 tons of FFB per hour and 1 Remah Rubber Factory. PT Perkebunan Nusantara V is a member of state-owned agribusiness holding company PT Perkebunan Nusanatara III (Persero) or PTPN Group. Based on the Government Regulation No 72 of 2014, PTPN Group holds 90% shares in PTPN 5. Other 10% remaining shares in PTPN 5 was owned by the Government of Indonesia. According to information found in PT Perkebunan Nusantara V Annual Report 2016 as cited by JobsCDC.com, PTPN 5 registered total revenue of Rp 4,492.55 billion in 2016. This number is up 3.33% from Rp 4,347.50 billion in 2015. Total comprehensive profit in 2016 amounted to Rp 43.34 billion or down from Rp 112.77 billion in 2015. Education background Bachelor Degree or Equivalent (S1/D4) with minimum accreditation of majors / study programs B and Master Degree (S2) Psychology Professions. Minimum GPA of 2.75 from State Universities and 3.00 Private Universities (4.00 scale). Required Male for Asisten Bidang Tanaman and Asisten Bidang Teknik (according to the nature of the work). Not tattooed / pierced on the body. Never commit a criminal offense / illegal act. Never disrespectfully discharged from government or private institutions or legal entities. Have a job search card (AK / 1 Card). Maximum age of 30 years old on 31 December 2018. Bidang Tanaman : S1 / D4 degree in Agriculture Department of Agrotechnology / Agriculture / Agronomy, Plantation Crop Cultivation, Soil Science, Pests and Diseases / Plant Protection, Forestry (Forest Conservation). Bidang Teknik : S1 / D4 degree in Engineering Department of Mechanical Engineering, Electrical Engineering, Agricultural / Plantation Product Processing Engineering, Civil Engineering, and Information Technology (Computer Engineering, Information Technology, Informatics Engineering). Bidang Keuangan : S1 degree in Economics Department of Accounting (preferably has an Accountant State Register), Management, and Development Economics. Maximum age of 32 years old on 31 December 2018. S1 degree in Economics majoring in Accounting and possess an Accountant State Register, and Mastering SAP. Minimum 3 years of experience in KAP (Public Accountant Office / Audit Service Office / other similar Financial Audit Agency). S1 degree in Law and possess an Advocate Identification Card (KTPA), an Advocate License, an Advocate Oath / Minutes from the High Court, and a minimum of 3 years work experience at the LBH / Attorney's Office. JobsCDC.com now available on android device. Download now on Google Play here. Please be aware of recruitment fraud. The entire stage of this selection process is free of charge. PT Perkebunan Nusantara V - Assistant Program PTPN Group October 2018 will never ask for fees or upfront payments for any purposes during the recruitment process such as transportation and accommodation.